BJP's decision to gamble on new faces from Nainital and Pauri parliamentary constituencies came after the sitting MPs decided not to contest this time. The BJP on Thursday decided to field Uttarakhand state unit chief Ajay Bhatt and his predecessor Tirath Singh Rawat from Nainital and Pauri seats respectively, replacing former chief ministers BC Khanduri and Bhagat Singh Koshiyari. The announcement was made after the party's central election committee released its first list of 184 nominees for the Lok Sabha polls beginning next month. BJP's decision to gamble on new faces from Nainital and Pauri parliamentary constituencies came after the sitting MPs-- Mr Koshiyari and Mr Khanduri-- decided not to contest this time. While Mr Khanduri had expressed his unwillingness to enter the poll fray citing ill health, Mr Koshiyari decided not to contest to make room for younger leaders. Considering their tall stature in the state politics, it will be interesting to see how their substitutes, who face the challenge of retaining the seats, fare at the hustings. Both Ajay Bhatt and Tirath Singh Rawat are former party MLAs. The sitting MPs from Haridwar, Tehri and Almora were, however, retained by the BJP. Party candidate for Tehri, Mala Rajya Laxmi Shah and Tirath Singh Rawat will file their nominations on Friday. 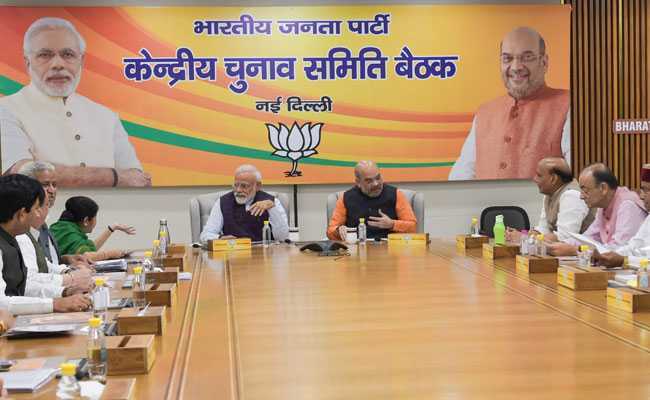 While, the BJP candidate from Haridwar and former chief minister Ramesh Pokhriyal Nishank, Ajay Bhatt and Ajay Tamta from Almora will file their nominations on March 25, party state unit media chief Devendra Bhasin said.